The noble flamingo is one of the strangest birds in the animal kingdom. It’s bright pink, for one, and that’s odd in and of itself. The fact that the ungainly birds display a supernatural sense of balance is also fairly unusual, but even the graceful flamingo can have an off night. For example, take this particular bird caught mid-flop by an amateur photographer at a zoo in Russia. Visiting zoo patron Tatiana Adamenko snapped a picture of a flamingo losing its balance at the Moscow Zoo. 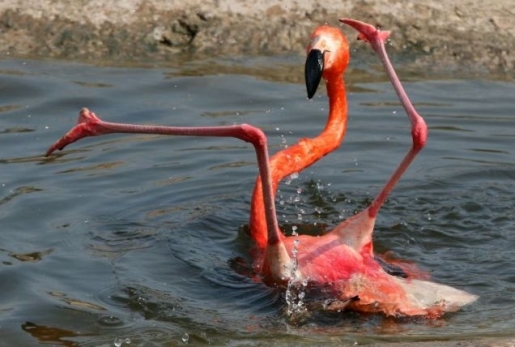 “I was just taking some shots of the flamingo taking a dip when he just fell over,” said the woman, who captured the flopping flamingo with her Canon EOS 400D camera. Flamingos are supposed to be graceful, not goofy! After all, they stand on one leg for hours at a time and are known for their grace and balance. This particular flamingo, ahem, is the antithesis of graceful and well-balanced. Still, the bird was able to recover well. After flipping itself over in a few awkward somersaults, the bird managed to right itself and swam away as if nothing ever happened.